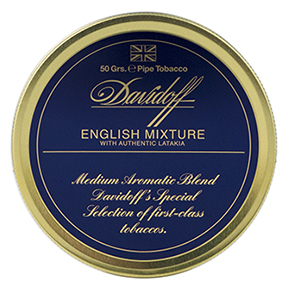 As with Davidoff's premium cigars, the luxury brand's tinned pipe tobaccos are curated for the ultimate in sophisticated smoking enjoyment. 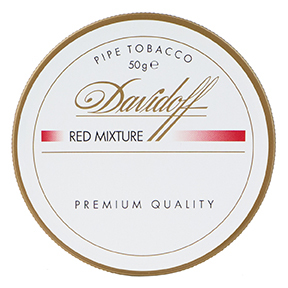 These specially selected and expertly blended high grade tobaccos create classically traditional mixtures with invitingly elegant flavors and aromas that whisper "this is Davidoff." All of the Davidoff blends listed here are produced in Denmark. 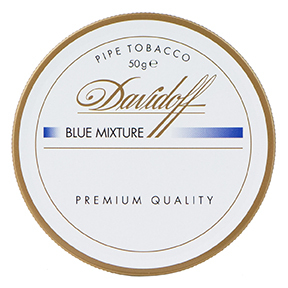 Davidoff's Blue Mixture is a cool smoking, exhilarating aromatic blend of premium broad-cut Black Cavendish, toasted Burley, and Virginia Cut Plug that develops a slightly sweet and pleasant aroma. 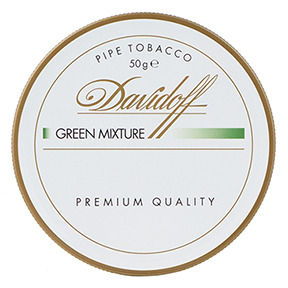 A select blending of mature Virginias, flavorful Burleys, and Black Cavendish make Davidoff's Green Mixture aromatic pipe tobacco a smooth, pleasurable smoke with a fresh and slightly fruity room note. 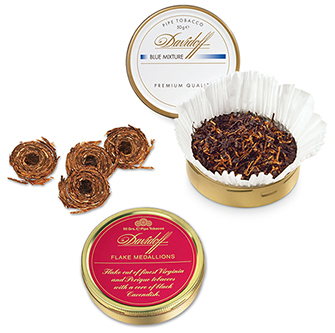 Red Mixture aromatic pipe tobacco is exceptionally smooth, burns evenly, and shares a distinctive aroma attributed to a luxurious blending of Black Cavendish tobaccos contrasted with Virginia Ribbon Cut. This classic Danish aromatic is blended with the highest quality Virginia and Burley tobaccos further enhanced with a dash of toasted Black Cavendish, offering a richly balanced and enjoyable tobacco aroma to your surroundings. Davidoff captures the essence of a traditional English blend with an aromatic twist. Virginias, Burleys, and Latakia are in the forefront with a touch of Perique added to further enrich the bouquet. English Mixture is a very subtle aromatic with lasting flavor. Davidoff pairs the striking aroma of Perique with the natural sweetness of Virginias to give Flake Medallions its flavor. The core of mild, fermented Black Cavendish adds sophistication to this aromatic blend. 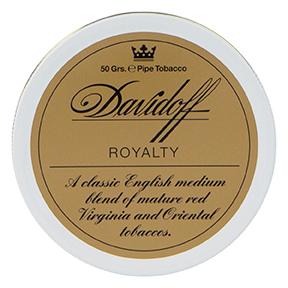 The one true English among Davidoff's luxury pipe tobacco offerings, Royalty is a classic medium blend of exceptional spiciness derived from mature Red Virginia and Oriental tobaccos with a characteristic aromatic pinch of Latakia tobacco. Davidoff's aromatic Scottish Mixture is blended from select Virginias, Burleys, and Kentucky with a touch of Oriental tobaccos and dash of the finest Scotch whisky, giving this light and flavorful middle-cut blend a fresh and delicate aroma.